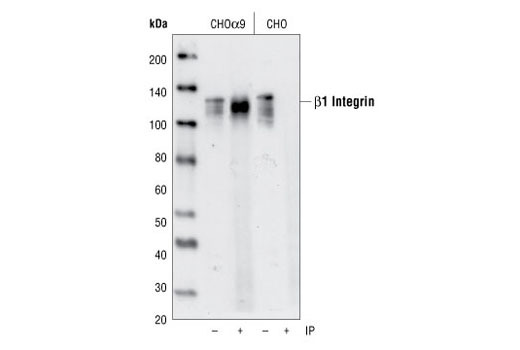 Immunoprecipitation of α9/β1 integrin from CHO cells transfected with human α9 integrin. 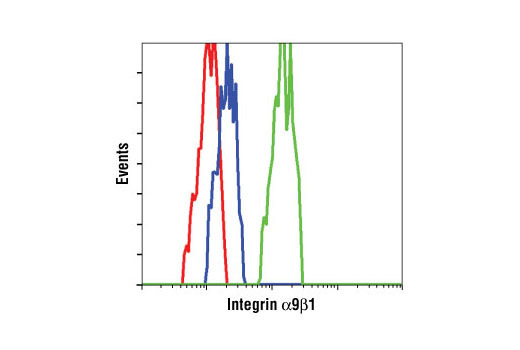 Endogenous β1 integrin was detected by western blot using Integrin β1 Antibody #4706. Flow cytometric analysis of CHO cells, untransfected (blue) or transfected with human α9 integrin (green), using Integrin α9β1 (Y9A2) Mouse mAb compared to a nonspecific negative control antibody (red). Integrin α9β1 (Y9A2) Mouse mAb detects endogenous levels of total α9/β1 integrin heterodimer. Monoclonal antibody is produced by immunizing animals with murine L cells transfected with human α9 integrin protein. Integrins are transmembrane glycoproteins that form heterodimers consisting of one α and one β subunit. The dimers act as receptors for extracellular matrix (ECM) proteins at sites of cell adhesion, and interact with focal adhesion (FA) proteins on the cytosolic side, forming the connection between the ECM and the actin cytoskeleton. Signaling to and from integrins regulates cell adhesion, motility, proliferation, apoptosis and gene expression, impacting cellular processes such as development, wound healing, immune response, invasion, metastasis and angiogenesis (reviewed in 1,2). α9β1 integrin is expressed in epithelial cells, smooth and skeletal muscle, neutrophils and hepatocytes (3). Its ligands include the ECM protein tenascin (4) and vascular cell adhesion molecule-1 (VCAM-1) (5). The cytoplasmic domain of α9 integrin binds the focal adhesion adaptor protein, paxillin, inhibiting cell spreading (6,7). Binding of the α9 cytoplasmic domain to spermidine/spermine N(1)-acetyltransferase (SSAT) mediates α9/β1 enhancement of cell migration (8). Physiological functions include development of the lymphatic system (9), possibly through binding to the lymphatic vascular endothelial growth factors VEGF-C and -D (10), neutrophil migration (5), and myogenic differentiation (11). Palmer, E.L. et al. (1993) J. Cell Biol. 123, 1289-1297. Yokosaki, Y. et al. (1994) J. Biol. Chem. 269, 26691-26696. Taooka, Y. et al. (1999) J. Cell Biol. 145, 413-420. Young, B.A. et al. (2001) Mol. Biol. Cell 12, 3214-3225. Liu, S. et al. (2001) J. Biol. Chem. 276, 37086-37092. Chen, C. et al. (2004) J. Cell Biol. 167, 161-170. Huang, X.Z. et al. (2000) Mol. Cell Biol. 20, 5208-5215. Vlahakis, N.E. et al. (2005) J. Biol. Chem. 280, 4544-4552. Lafuste, P. et al. (2005) Mol. Biol. Cell 16, 861-870.